Four refineries along the Salish Sea are receiving processed tar sands bitumen fed through a branch of the existing Trans Mountain pipeline: Shell’s Puget Sound Refinery and the Andeavor Anacortes Refinery which are both located in Skagit County, Washington, and the BP Refinery and Phillips 66 Refinery which are located in Whatcom County, Washington. There has already been a good deal of resistance to the proposed pipeline expansion, and that is growing. Indigenous nations within Canada have been some of the strongest resisters to the expansion which, if built, would add a new pipeline to the existing Trans Mountain line that would triple the capacity of tar sands bitumen flowing through the line. The expansion of the pipeline would run through unceded Indigenous territories. The Intercept article reported that law enforcement agencies on both sides of the U.S. – Canada border have been preparing for potential escalation of protests and resistance to the proposed pipeline project. Will Parrish, one of the two reporters who wrote The Intercept article, had obtained public records from Whatcom County, some of which, were highlighted in the article. A couple of those email records highlighted by The Intercept were of particular interest to Searchlight Review. Gargett further informed the email recipients that it was cited in the article that “there are groups opposing the pipeline on our side of the border.” He provided a link to the website for Protect The Inlet, and a link to a March 10, 2018 Protect The Inlet Facebook event. What Gargett referred to as a take over by activists last year was the October 24, 2017 incident in which a 28-year-old Michigan man and a 41-year-old California woman were arrested after they allegedly broke into the Kinder Morgan Trans Mountain Pipeline facility and attempted to turn a valve on the oil pipeline, according to Skagit County Chief of Patrol, Chad Clark, who was referenced in an October 24, 2017 GoSkagit.com article. 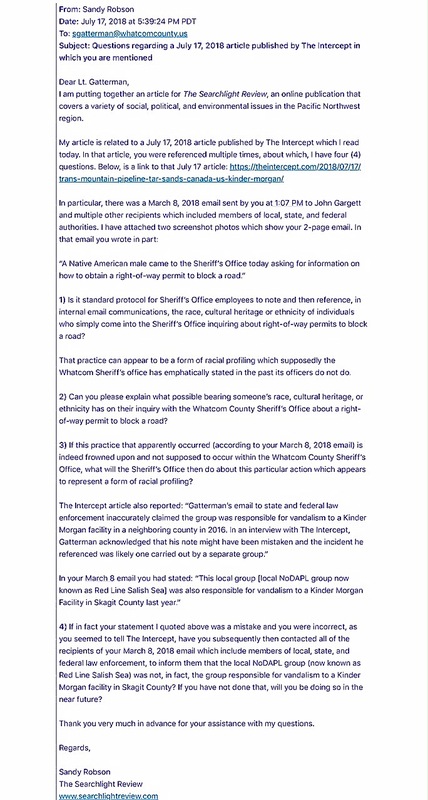 In response to Deputy Director Gargett’s email, Lt. Steven Gatterman of the Whatcom County Sheriff’s Office, sent a March 8, 2018 email reply which also was sent to all of the recipients copied on the deputy director’s original email. 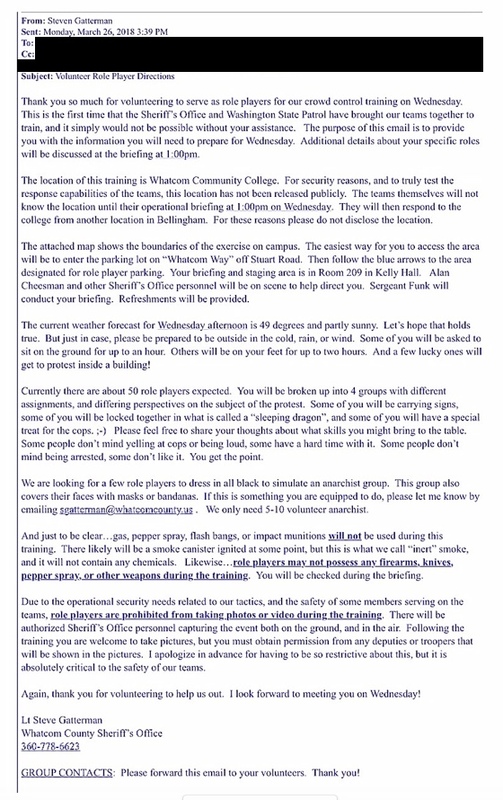 In his March 8 email, Lt. Gatterman informed recipients that the Whatcom County Sheriff’s Office had been tracking the March 10 event for a few weeks, and that the protests had already started in B.C. with some roadblocks happening the day before (March 7), and more that were planned for March 8. He told email recipients it was anticipated that there would be several thousand demonstrators at the Lake City Way Sky Train Station, in Burnaby, B.C., on Saturday, March 10. The lieutenant also reported that the Whatcom County Sheriff’s Office had alerted its special events team (Civil Disturbance Unit) and that it would be disseminating intel and information to patrol about Kinder Morgan targets in Whatcom County. Gatterman added that the Sheriff’s Office had additionally been in touch with the Washington State Patrol District 7 Rapid Deployment Force Commander regarding the event, and that the Sheriffs Office’s Crime Analysis Unit was continuing to search for intelligence information. There were multiple disturbing inaccuracies and references contained in Lt. Gatterman’s March 8 email which are outlined below. His email prefaced a March 28, 2018 joint training exercise hosted by the Whatcom County Sheriff’s Office and conducted in cooperation with the Washington State Patrol. The training, which centered on crowd control, was held on the grounds of Whatcom Community College, and was offered to various law enforcement personnel. In his March 8 email, Lt. Gatterman provided what he said were “a few things for consideration,” the first of which, was information he provided about what he referred to as “the local No-DAPL group” (now named Red Line Salish Sea). He said it was expected that the group would be active on Saturday (March 10), but because the group keeps things under the radar, it was unknown whether their activity would be in B.C., or locally. There were no reports by local news media or posts on local social media of any Trans Mountain Pipeline protest actions which occurred in Whatcom County on March 10. According to its Facebook page, Red Line Salish Sea (formerly known as the Bellingham #NoDAPL Coalition) is indigenous-led, Bellingham-based organizing, formed in solidarity with the Standing Rock Sioux Tribe’s opposition to the Dakota Access Pipeline (DAPL) project. It was reported by one or more news media outlets that individuals associated with the Bellingham #NoDAPL Coalition were allegedly involved to some degree in organizing the February 11, 2017 NoDAPL peaceful march and demonstration that went onto Interstate 5 in Bellingham, blocking the roadway for approximately 45 minutes until water protectors/demonstrators left on their own accord. 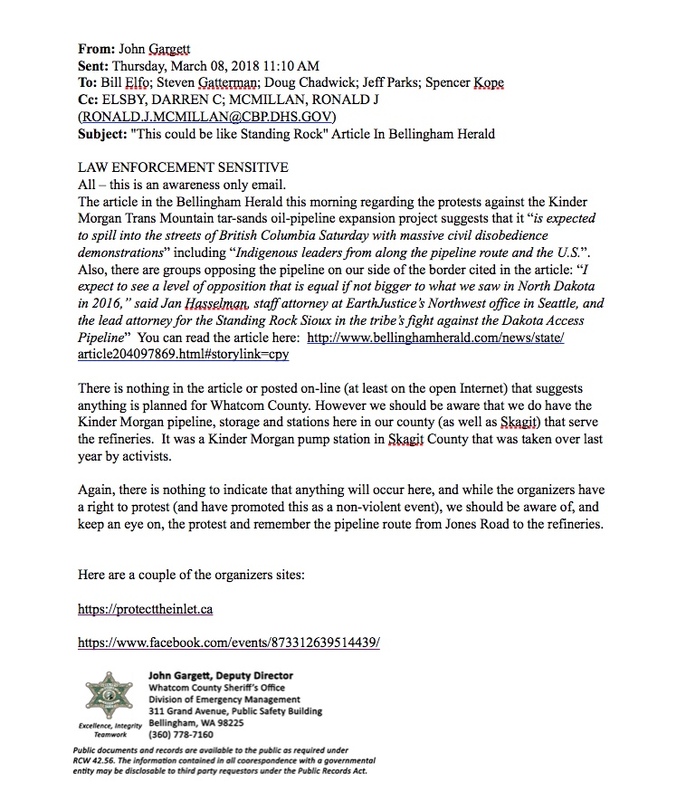 However, it is important to note that the same group, Bellingham #NoDAPL Coalition, was not involved in organizing the May 7, 2016 blockage of State Route 539, as Lt. Gatterman had stated was the case in his March 8, 2018 email. In the multiple news accounts which reported on that road blockage on May 7, 2016, the day of then-candidate for U.S. President, Donald Trump’s campaign rally in Lynden, Washington, there was no mention of the Bellingham #NoDAPL Coalition to substantiate Lt. Gatterman’s assertion. Even more significant, is the fact that the Bellingham #NoDAPL Coalition group was not yet in existence back in May of 2016, when the State Route 539 blockage occurred. Another disturbing inaccuracy coming from Lt. Gatterman’s March 8 email was that in describing what he referred to as “the local No-DAPL group,” the lieutenant also incorrectly attributed an act of vandalism to the group, which he said had occurred last year at a Kinder Morgan facility in Skagit County. 1) Is it standard protocol for Sheriff’s Office employees to note and then reference, in internal email communications, the race, cultural heritage or ethnicity of individuals who simply come into the Sheriff’s Office inquiring about right-of-way permits to block a road? That practice can appear to be a form of racial profiling which supposedly the Whatcom Sheriff’s office has emphatically stated in the past its officers do not do. 2) Can you please explain what possible bearing someone’s race, cultural heritage, or ethnicity has on their inquiry with the Whatcom County Sheriff’s Office about a right-of-way permit to block a road? 3) If this practice that apparently occurred (according to your March 8, 2018 email) is indeed frowned upon and not supposed to occur within the Whatcom County Sheriff’s Office, what will the Sheriff’s Office then do about this particular action which appears to represent a form of racial profiling? 4) If in fact your statement I quoted above was a mistake and you were incorrect, as you seemed to tell The Intercept, have you subsequently then contacted all of the recipients of your March 8, 2018 email which include members of local, state, and federal law enforcement, to inform them that the local NoDAPL group (now known as Red Line Salish Sea) was not, in fact, the group responsible for vandalism to a Kinder Morgan facility in Skagit County? If you have not done that, will you be doing so in the near future? Lt. Gatterman sent a brief reply on July 18 which said, “Our office will reply as soon as possible.” After not receiving his response to the questions by July 20, Searchlight Review contacted, via email, Whatcom County Sheriff Bill Elfo, that day, asking him if he could respond to those four questions. 1. 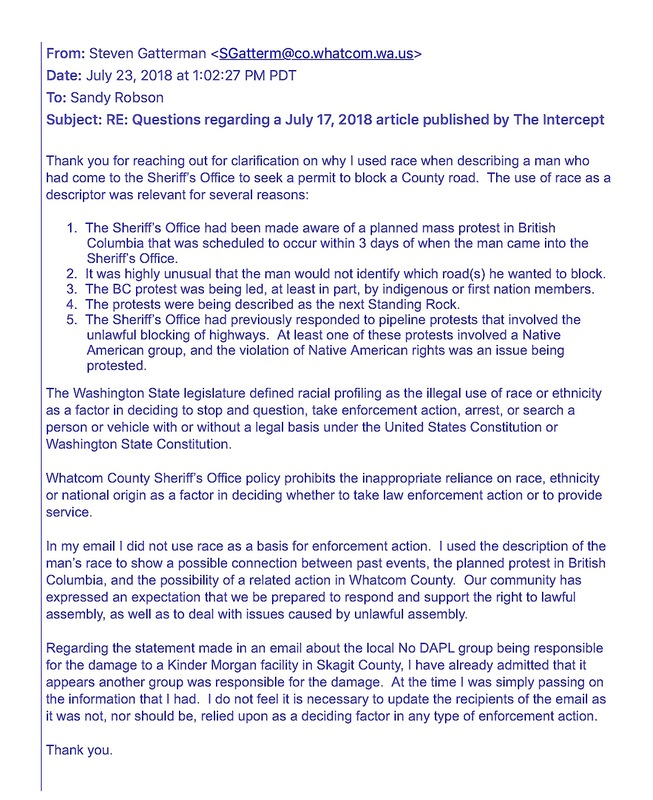 The Sheriff’s Office had been made aware of a planned mass protest in British Columbia that was scheduled to occur within 3 days of when the man came into the Sheriff’s Office. 2. It was highly unusual that the man would not identify which road(s) he wanted to block. 3. The BC protest was being led, at least in part, by indigenous or first nation members. 4. The protests were being described as the next Standing Rock. 5. The Sheriff’s Office had previously responded to pipeline protests that involved the unlawful blocking of highways. At least one of these protests involved a Native American group, and the violation of Native American rights was an issue being protested. Gatterman’s responses about racial profiling were wrapped in the context of taking enforcement action. However, the incident of a Whatcom County Sheriff’s Office employee having noted that the permit requestor was Native American, and Lt. Gatterman’s decision to include that in an email communication to federal, state and local law enforcement personnel, speaks to an institutionalized and/or systemic form of profiling individuals based on race, ethnicity, religion or national origin. In reading Lt. Gatterman’s list of the five reasons he provided Searchlight Review as to why the “use of race as a descriptor was relevant,” those reasons do not appear to justify a Whatcom County Sheriff’s Office employee noting the race or ethnicity of the individual who inquired about the permit. It would seem that the targeting of suspected anti-pipeline activists, and the surveillance of those individuals and indigenous-led groups, further perpetuates the already existing racial and/or ethnic profiling by law enforcement. And, if by “past events,” Gatterman meant the events he attributed to “the local No-DAPL group” (Red Line Salish Sea) in his March 8 email, it appears that he may be incorrect when he attributed some of those events or actions to their group. Searchlight Review contacted the Skagit County Sheriff’s Office inquiring about any possible acts of vandalism or similar criminal incidents which may have occurred at the Kinder Morgan Trans Mountain Pipeline facility over the last several years. The support services technician for the Skagit County Sheriff’s Office responded, via email, saying there have been only two incidents which occurred at the Kinder Morgan Trans Mountain Pipeline facility over the last several years; one in October 2016, and one in October 2017. After reviewing the public records released to Searchlight Review by the Skagit County Sheriff’s Office, and after reviewing news reports about those two incidents, there is no indication that the Bellingham #NoDAPL Coalition (now named Red Line Salish Sea) was involved in either of those. For Lt. Gatterman not to realize the importance of correcting the inaccurate information he provided to federal, state, and local law enforcement personnel about the Bellingham #NoDAPL Coalition contradicts the stated vision, mission and values listed on the Whatcom County Sheriff’s Office website. What is the Sheriff’s Office’s interest in monitoring the C2C Facebook page? Along with the multiple inaccuracies and the inappropriate reference to an individual’s race pointed out above, there was one additional disconcerting reference that Lt. Gatterman made when he chose to include the Community to Community Development (C2C) group in his list of a “few things for consideration” in his March 8 email reply to Deputy Director Gargett. Gatterman told the email recipients that the group had a scheduled event planned for Saturday (March 10), which was the “Re-Imagining Solidarity Conference” to be held at the University of Washington. C2C, according to its Facebook page, is “an eco-feminist women-led organization striving to reclaim our humanity by redefining power to end settler colonialism, capitalism, and patriarchy in their external and internalized forms.” The group’s Facebook page further points out that C2C is an action oriented organization working towards food sovereignty and a solidarity economy, and it provides support to grassroots front-line farm worker leaders and farm worker families. Gatterman told the law enforcement personnel recipients of his March 8 email that he was not sure if C2C’s March 10, 2018 conference and the posts made on the Protect The Inlet Facebook page — which requested that people stop talking about the meeting/training being organized in Washington — were related. It is unclear what motivated Lt. Gatterman to have chosen to bring C2C into his email relating to the March 10, Trans Mountain Pipeline project protest slated to occur in B.C. In fact, in reviewing C2C’s Facebook page and looking back at posts made in February of this year which was the month leading up to the protest, and going through the entire month of March, there was not one post pertaining to pipelines. The bulk of the posts were about farm worker justice, immigration, food sovereignty, and other issues in line with the group’s mission. It is possible that the recipients of Gatterman’s March 8 email may now wrongly associate C2C’s organization with pipeline protests and related actions, and that the Whatcom County Sheriff’s Office may likely continue its monitoring of the group’s Facebook page as has apparently already been occurring. 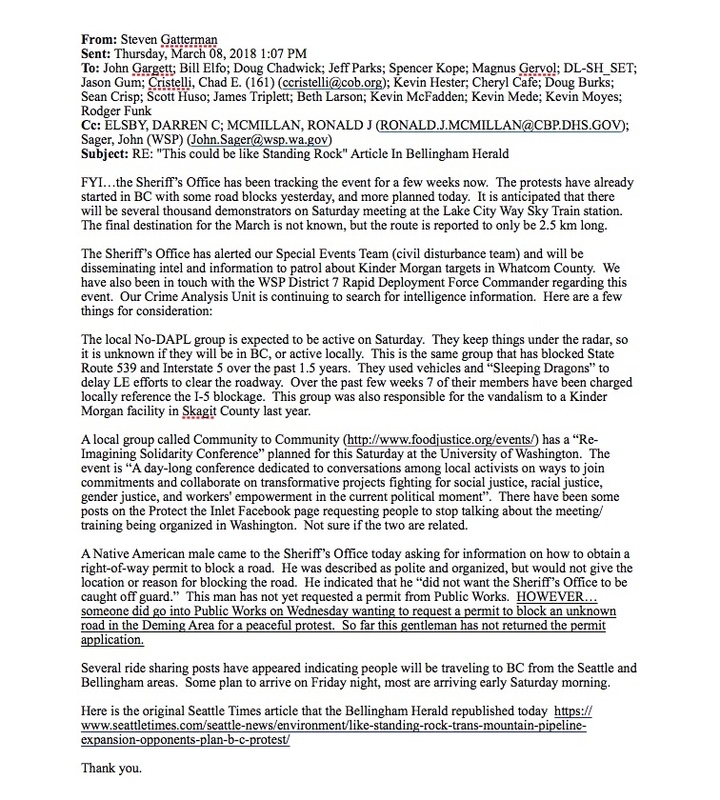 The multiple inaccuracies and references contained in Lt. Gatterman’s March 8, 2018 email he sent to federal, state, and local law enforcement are concerning, and are potentially damaging to both Red Line Salish Sea and C2C in terms of their groups’ reputations and potential treatment by law enforcement in the future, and speaks to the continued need for the development of a civilian oversight board to watch over activities of the Whatcom County Sheriff’s Office. Posted in Commentary, Information and tagged BP Cherry Point Refinery, Dakota Access Pipeline, Endeavor Anacortes Refinery, Environment, First Nations, Human Rights, I-5 Protest, John Gargett, Kinder Morgan Inc., Native American Treaty Rights, Native Americans, Phillips 66 Ferndale Refinery, Protect the Inlet, Red Line Salish Sea, Salish Sea, Shell Puget Sound Refinery, Social Justice, Standing Rock Sioux Tribe, Steven Gatterman, The Intercept, Trans Mountain Pipeline, U.S. Customs and Border Protection, Washington State Fusion Center, Washington State Patrol, Whatcom County, Whatcom County Sheriff's Office. Bookmark the permalink.